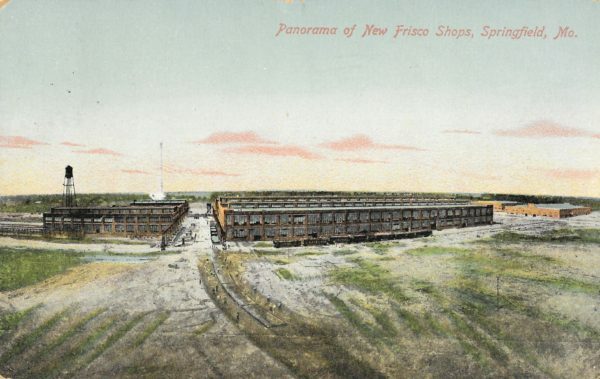 1913 Postcard: Panorama of new Frisco Shops – Springfield, Missouri. 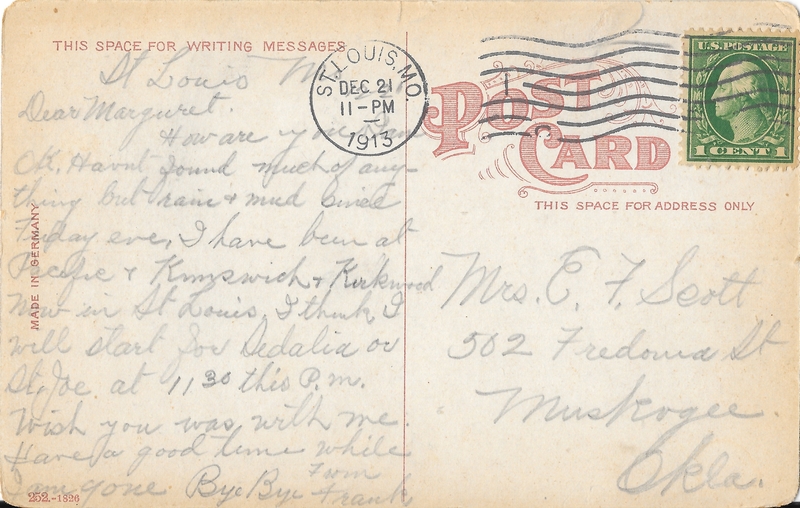 This letter was donated to the Frisco Archive by Fred Pavey. 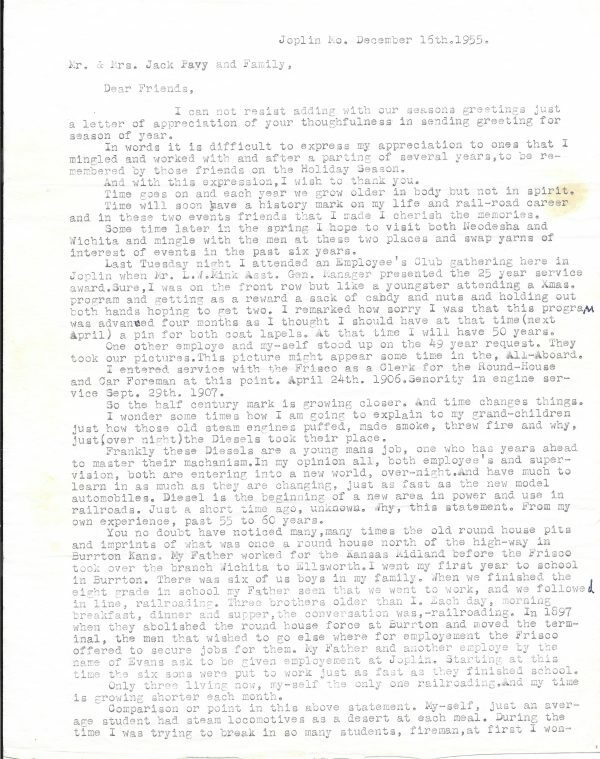 He commented: The second two-page letter is dated 12/16/55 and again the writer talks about what is happening on the Frisco in and around Joplin. In one of the letters he gives names of co-workers and where they are on the seniority list. He also talks about the Frisco in Burrton, Kansas where his father was employed by the Frisco until they abolished the roundhouse and the family moved to Joplin. There is much more in these letters that I have not covered and it is very informative. 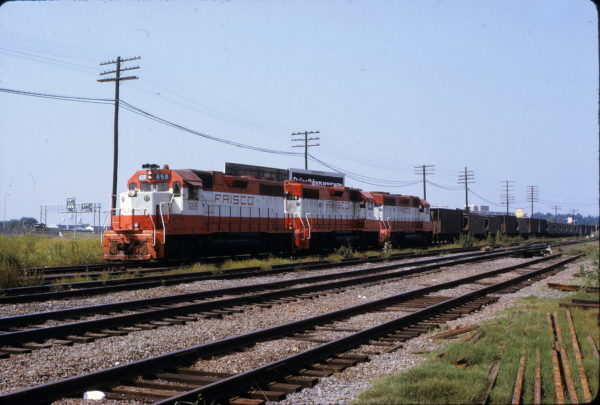 GP38AC 658 and GP38-2s 406 and 675 at Memphis, Tennessee in September 1973. The train is southbound on the Memphis Subdivision. The locomotives have just crossed over the Mississippi River on the single track Frisco Bridge. Just off the bridge, they have passed the start of Frisco’s two main tracks through the city at Shelco (Shelby County), mile post 483.1 (MP 483.1), but are North (geographic West) of Union Railway Crossing, MP 483.6. This later point was known as Kentucky Street on the railroads to the immediate North (CRIP, MoP, SSW). In the lower portion of the photo, North of the Frisco’s tracks, are three tracks of these railroads. At this point the train is entering the West end of “Broadway”. “Broadway” is a 2.8 mile East/West corridor of multiple tracks for various railroads extending from the two railroad river crossing bridges (Frisco and Harahan) east to KC Junction. KC Junction lies between Interstate Highway 69 (I-69) to the West and South Waldran Boulevard to the East. At KC Junction the Eastern railroads (Nashville, Chattanooga and St. Louis (NC&SL) – Louisville and Nashville (L&N), Southern (Sou), and Union Railway (URY (- OP)) diverge to their individual routes and yards to the Northeast, East and the Frisco to the Southeast. The highway bridge in the distance is the four-leaf clover style junction with spokes of Interstate Highway 55 (West and South) at milepost exit 12, E.H. Crump Boulevard (East) and Riverside Drive (North). The westward bound left hand highway sign notes Interstate Highway 55, U.S. Highway 61 North, St Louis, U.S. Highways 64, 70 and 71. The right hand exit sign notes Interstate Highway 55 South, Jackson, Mississippi. Out of view to the West (photo right edge) of this location are three parallel, through truss, major bridges crossing the Mississippi River. On the North (upstream) side is the Harahan Bridge (CRIP, MoP, SSW). It has double tracks, is 4,972 feet long and was opened on July 14, 1916. On the South side is the Memphis & Arkansas Bridge (“old highway” bridge). This is the most southern of the three bridges, is four vehicle lanes wide, 5,222 feet long and was opened on December 17, 1949.